IF, like George Michael, the heart you gave someone last year was binned on Boxing Day, it might be a good idea to head to Gibraltar and buy some proper presents this time around. With classic shops such as Marks and Spencer’s, BHS and Toys R Us combined with quirky independent stores, Gibraltar is the perfect place to find presents for all the family. 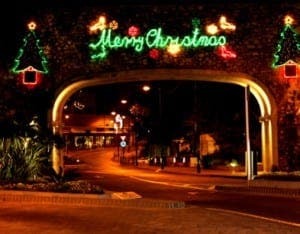 Plus, there’s enough festive spirit going round the Rock to make visitors want to stay more than just another day. Festive shows, Santa’s grotto and Christmas fairs are just a few of the treats on offer. And for some of the best food and wine (mistletoe optional) this side of Lapland, Gibraltar’s the one thanks to its huge range of bars and restaurants. There won’t be snow falling all around us, but the whole place will be having fun when the Christmas lights are switched on during a party in John Mackintosh square. Featuring songs and dance, the show will last from 5:30-8pm on November 20, so make sure you drive/cycle/walk home in time for it. WHISPER it quietly, but Father Christmas is coming to Gibraltar a few days early this year. Kings Bastion Leisure Centre will be transformed into a winter wonderland as the elves take over from December 7- 23. Plus, Santa will be inviting lucky kids to meet him in his grotto before heading back to his North Pole workshop for final preparations. Entrance is £5 and includes a gift. Santa’s Grotto is open every weekday from 4:30pm -6:30pm.